Two Playstation 2, two GameCube, four N64, two Xbox, four Wii, two Guitar Hero. You get the idea, I have lots of controllers. So does Matt Gemmell. And I’m sure, so do a lot of other people. My solution for organising them is a fairly simple one, but I haven’t seen it documented elsewhere on the web. So here it is. I had an old DVD rack not being used for anything so I figured using that would be a good start (and avoid any cost to me). I purchased some blank DVD cases and popped them in every forth slot. 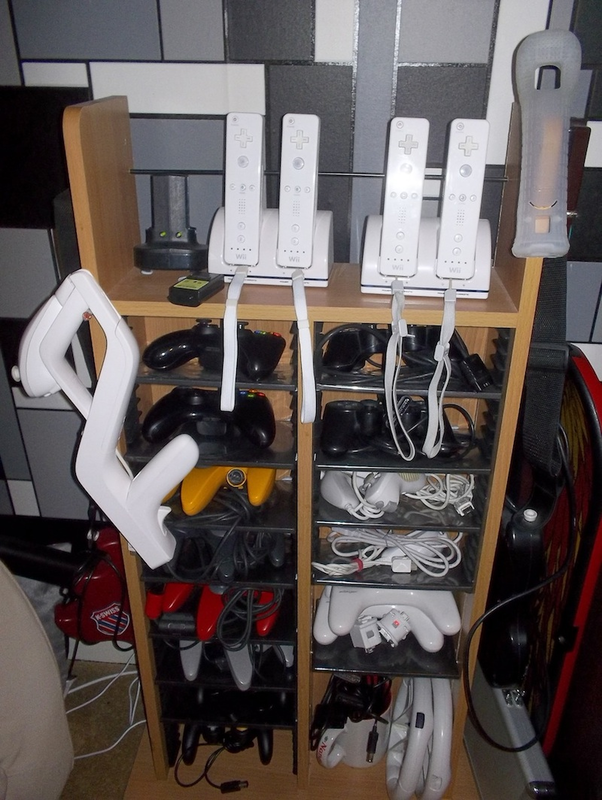 This gave me enough spaces to house all of my controllers as well as a couple of spaces for Wii Nunchucks. I also left a larger space at the bottom for those damn Wii wheels and a mug which holds all of my controller extension cables, extra memory cards for the PS2 and GameCube. 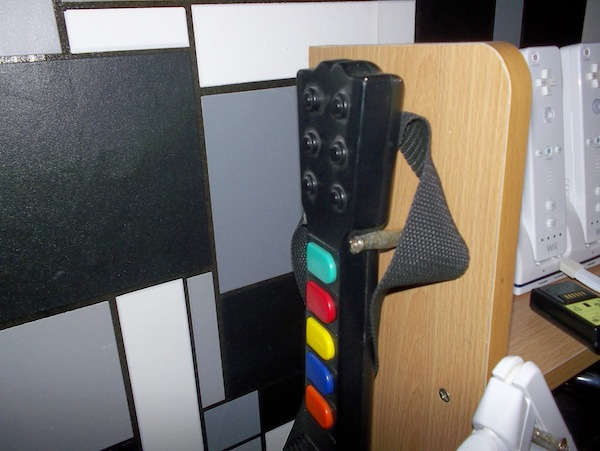 For the Guitar Hero controllers, I put some screws in each side of the rack (measuring the width before, of course) and wrapped them in Cellotape although electrical tape, which I didn’t have, would have been better. The Guitars slot nicely into these and hang out the way. I also stuck one screw in the front of the rack for the Wii Zapper.